As a teenager in the seventies, I remember reading my "NME" and "Melody Maker" and seeing the "best female vocalist" category in their polls. 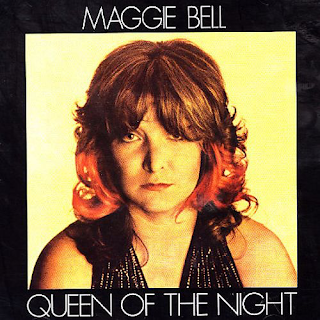 It was often topped by Maggie Bell. I had no idea who she was, and I often wondered if any of the people who voted for her did either. I presumed that they just though "hmmm, how many female vocalists are there? Suzi Quatro? No, too "pop". There's that Scottish blues rock singer, Maggie Bell. I'll vote for her...". She was the female equivalent of Frankie Miller - respected by the critics and those in the know and with a reputation for giving great live shows, but not shifting many records, thus never quite making it, which was a shame. Anyway, on to this excellent album. The opener "Caddo Queen" is an infectious piece of funky, upbeat blues rock, while Janis Joplin's "A Woman Left Lonely" is a solid, emotive "my man done me wrong" ballad. "Souvenirs" sees Maggie in full Janis Joplin mode again, delivering a truly superb, rasping blues vocal to this slow paced, horn-augmented ballad. "After Midnight" is familiar for being done by Eric Clapton. Maggie's version is more rhythmic, upbeat funky with some great guitar and a far more sexily raunchy vocal than Clapton's sleepy one. The title track is another big, bluesy Joplin-style number. Even Ringo Starr's slightly silly "Oh My My" is given a ballsy makeover. "As The Years Go Passing By" is a sumptuous slow blues, with some superb blues guitar and addictive horns. "Yesterday's Music" has a gospel-style backing vocal and a laid-back singalong feel. "We Had It All" is a soulful number, highlighted by some nice organ breaks. "Other Side" is a jaunty Carole Bayer Sager song that has Bell in playful mood. The blues ballad "Trade Winds" was made more well known by Rod Stewart covering it on 1976's "A Night On The Town". This is a good album, but is it one that makes you think "I have to own that album?" Probably not. It is an enjoyable half hour or so every now and again, however.